It’s as if my mother’s spirit knows. 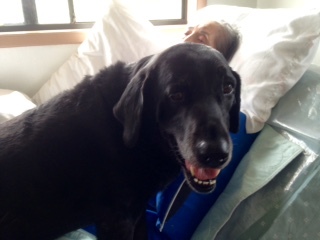 A week after we put her in palliative care, her condition devolved to a new low. She had previously been awake and occasionally alert in a wheelchair during the day. Now, though, she’s in bed all day and often sleeping. Her breathing is labored and her rale cough has worsened. She can either keep fading away, or she could asphyxiate from the fluid in her throat. The arms that held me when I was young are gaunt and bony. The feet I have always massaged are cold and darkening from lack of circulation. The shapely legs so many men admired in her showgirl days are thin and propped up on pillows. My friend Lori came to perform reiki on her. Lori applied essential oils, rang a bell, and channeled energy from the Universe to help clear and unhook my mother’s qi. It gave Mom energy for a few minutes. Her eyes opened and she smiled at me and nodded appropriate answers in this little moment of clarity. I wept. I held her hand, rubbed her arms, smoothed her hair. Eighty-eight, and her skin is still beautiful. I applied lotion to her body and balm to her dry lips, which she appreciated with a faint smile. She tried to speak but nothing came out. Alzheimer's Disease stole her words. She speaks with her eyes. “I know. I love you too, Mom.” And she smiled back. I miss her. I have missed her for so many years. I don’t miss her love because that still remains. I see it when she looks at me. I will come back tomorrow. Maybe my mother will be here to greet me. Maybe she won’t. But she will always be with me.